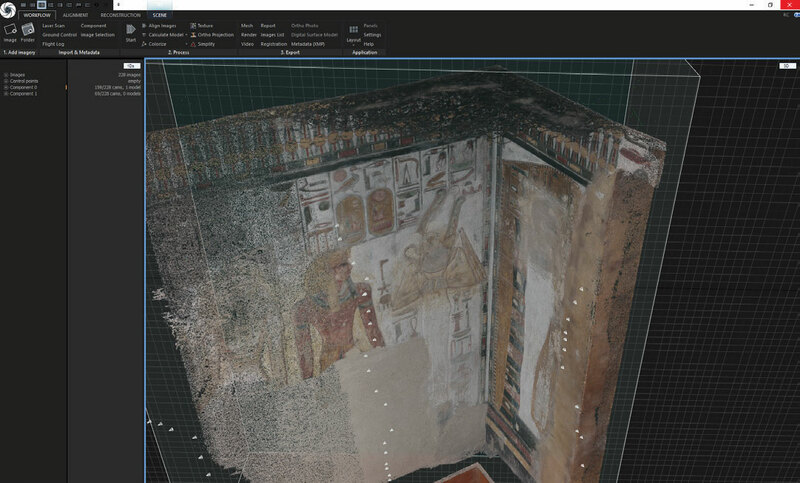 The excessive deterioration of the tomb made the tomb of Seti I the perfect candidate for digital preservation and provides a second case study, following the tomb of tutankhamun, of employing facsimiles to mitigate damage caused by tourism. With the data collected the tomb now has a baseline for future studies, a reference point to assess further damage, and provide guides for conservation. Groundbreaking study and assessment has already taken place on the data from the tomb of Tutankhamun. Lastly this offers a chance to repatriate facsimiles of artifacts and large portions of the tomb that have been extracted during the discovery in the early 19th century and distributed throughout the world. It provides the most complete and centralized collection of the tomb of Seti I for study and dissemination. As facsimiles need perfect geometry, the documentation process requires very high resolution. However, it requires larger scale and lower resolution data to place the digitized portions into context within situ as well. To accomplish this, a combination ultra high resolution Lucida (type for scanning), photogrammetry, and traditional terrestrial laser scanning were used in tandem. Because of the complex differences in the data types, Reality Capture was the perfect program combine everything into one cohesive dataset. The chambers of the tomb were scanned and photographed in Luxor in May 2016. 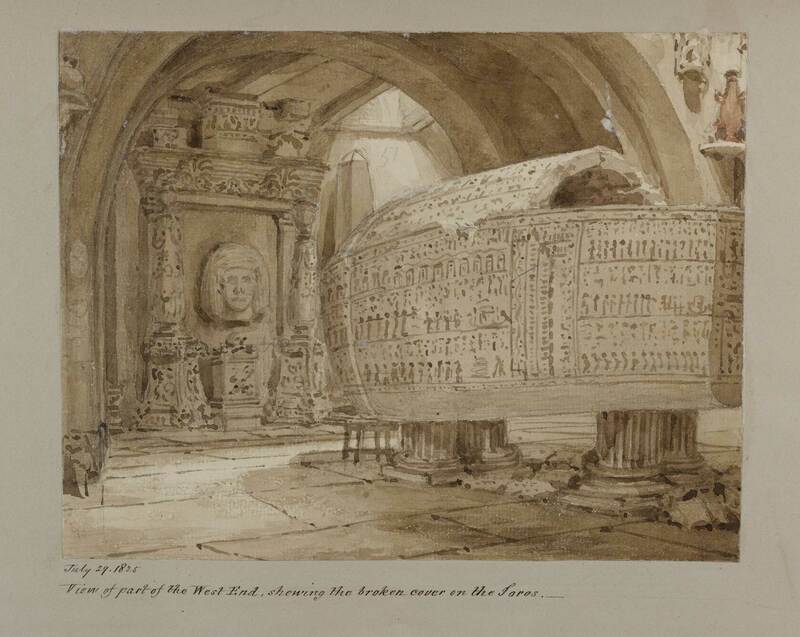 The sarcophagus and various objects from the original tomb were documented at the Sir John Soane’s Museum in London. More than twenty wall fragments removed after the tomb’s discovery in 1817 by Giovanni Battista Belzoni were examined and registered in the collections of the Museum of Fine Arts (Boston), the National Archaeological Museum of Florence, Ägyptisches Museum und Papyrussammlung (Egyptian Museum and Papyrus Collection) and the Louvre Museum. The burial chamber, the sarcophagus and the fragments were documented using the most suitable combination of high-resolution technologies for recording each object. These techniques include close & long-range 3D laser scanning, high definition colour composite photography and short & mid-range photogrammetry. Photogrammetric imagery was captured inside the tomb providing critical information for colour matching and understanding the unfinished walls. Multiple images are taken with a constant, diffuse, light-source using a DSLR camera and following a clearly defined protocol with significant overlap between each image. The multiple images are processed using Reality Capture, a software package by Capturing Reality from Bratislava. The results are starting to match the best results that are possible with more expensive 3D systems. 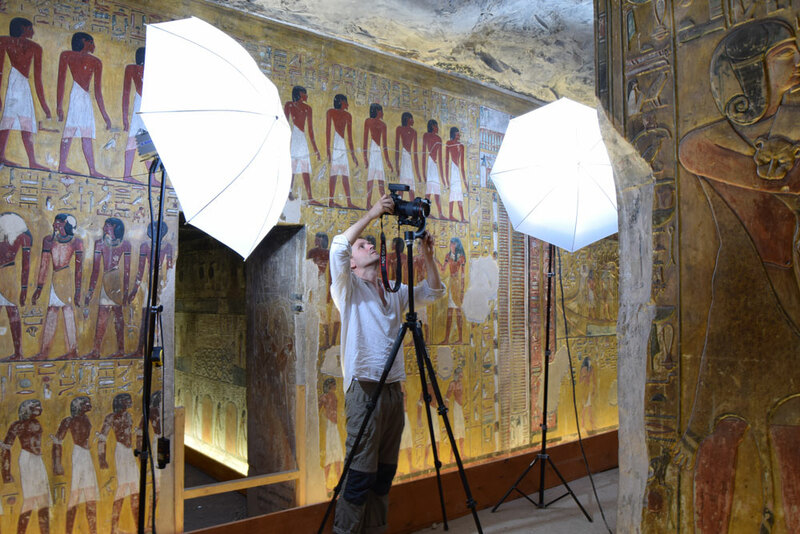 Photogrammetry is playing an important role in the recording the tomb of Seti I – It will become more important as the work proceeds. The imagery provides higher resolution geometry than the underlying point cloud, which as seen below, requires extremely fine detailing. Unlike the process of creating 2D elevations, architectural plans, or virtual environments which require high resolution textures, milling and 3D printing require fine geometry as it is that data that will be replicated. Traditional laser scanning does not provide a high enough resolution for this process. Despite the heavy influx of tourists following the tomb´s re-opening in November 2016, Factum Arte successfully completed a 3D survey of the tomb using a FARO Focus 130 Terrestrial Laser Scanner. The data obtained with this system provided information about the general geometry and spatial dimensions of the tomb. These provided the framework to which all other data was added to provide provenance to the scan and photo data. With the context and general geometry captured by the photogrammetry and laser scan data, the Lucida collects the fine detail integral to the reproduction process. However, limitation on mobility and adaptivity require the original data to fill 30% of the wall area as well as the roof and ground. The laser scan data was processed and registered in Faro Scene to generate a E57 point cloud. The photographs were processed in Lightroom to achieve ideal exposure, clarity, and coloration. After this portion the data is imported into Reality Capture for the bulk of the processing. The images were divided by room and each section was imported and aligned individually, being exported into unique components. Once all the rooms were processed, all of the components were registered together using the laser scan data as a scaled base. Once the project is successfully aligned a high resolution model of each individual wall in each room is created using the photogrammetry and laser information to allow for finer geometry on the smaller details. Unlike modeling for web or game use the highest resolution model with the most detailed geometry is preserved. Each high resolution wall mesh were exported into an OBJ format and edited into sections for the 3D printing process. Lastly, using the built in “Ortho Projection” tool, depth maps of each wall were created. These depth maps are used by the CNC routing machines as a topographic map of how deeply to excavate the material in each section across the panel. Factum Arte’s approach to the production of high-resolution facsimiles is dependent on the merging of the 3D information of the surface with the high-resolution, colour photography recorded in the tomb. Fabrication requires multiple methods of creating both the 3D surfaces and the 2D textures including elevated printing, routing, and elastic printing. The elevated printing technology of Project EIGER is a form of additive 3D printing. 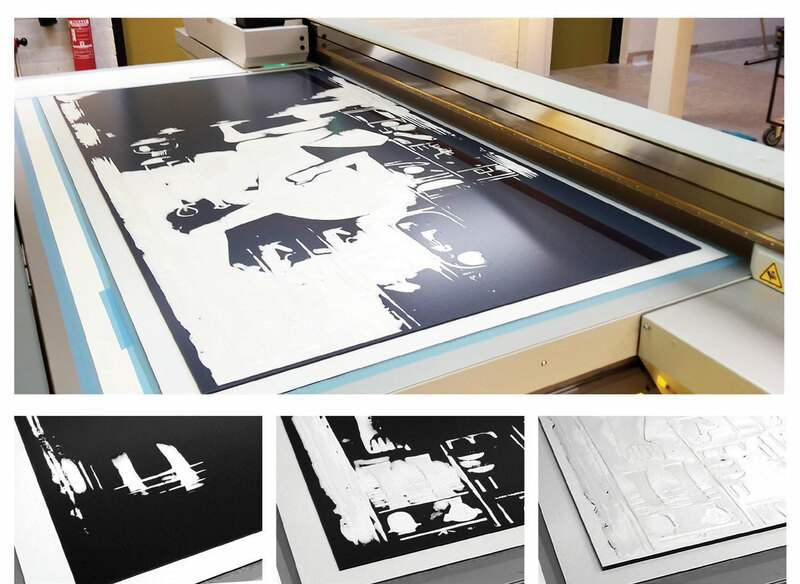 It can create fullcolour, textured prints with a maximum size of 2.44 x 1.19 m and a height up to 5 mm. To create these a depth maps exported from Reality Capture were combined by depth maps exported from the Lucida scanner. 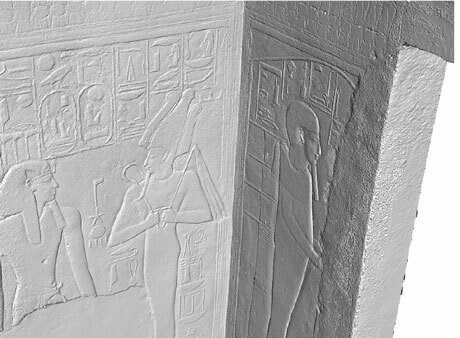 As the walls in the tomb of Seti I exceed the 5 mm,the research and development department of Océ- Technologies created an experimental slicing algorithm and modified the print processes to create monochrome prints with the required relief while maintaining the accuracy. 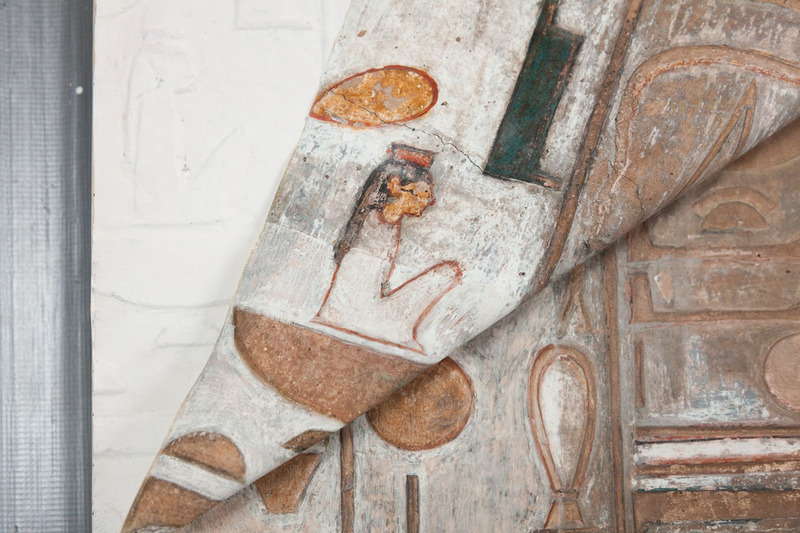 Factum produced a monochrome printing of the tomb of Seti I, and added colour later. The Océ prints were created as negative moulds of the walls of the tomb from which casts were taken. Had Belzoni had access to this non-contact technology, the walls of the tomb might retain their original colour today. 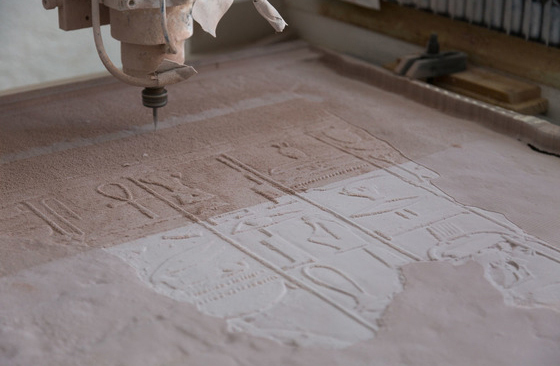 Most of the tomb has been carved into boards of polyurethane using CNC routing machines. Like the elevated printing, the routers were guided by depth maps exported from Reality Capture were combined by depth maps exported from the Lucida scanner. To rout a 1x1 m panel in 3D at a resolution of 250 microns takes approximately 120 hours. The walls were routed into panels of approximately 1 x 2 m that are then joined together. Once complete, these panels were assembled to form complete rooms. These are then cut into irregular shaped sections that can be transported and bolted together with invisible joints. The remaining portions of the exhibit were 3D Printed using a resin based system. The meshes used for printing were created within Reality Capture at the highest possible resolution and then reduced to the ideal polygon count from printing without detail loss. These meshes were then cleaned and prepared in an external program before being printed in house. The objects rounded out the exhibition with the routed and elevated printed panels. The preparation of an elastic printing media was a direct response to practical need. 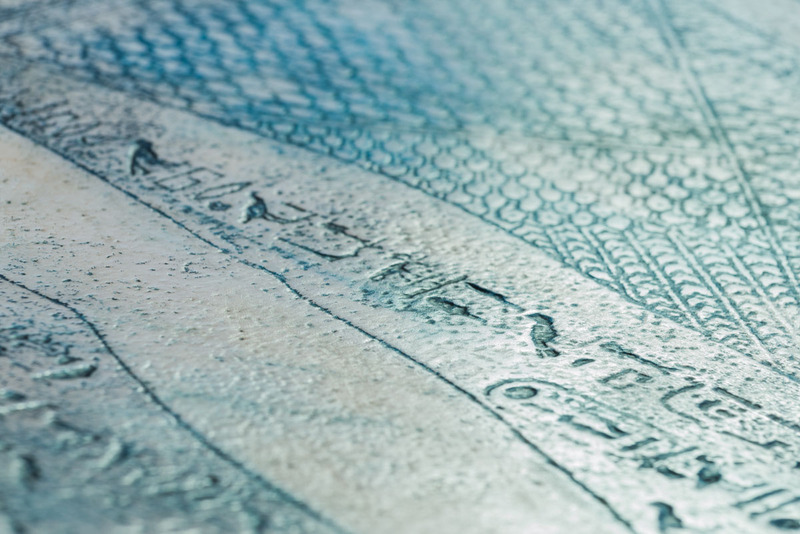 Factum Arte’s flatbed digital printer can overprint in perfect register but it cannot print a detailed and focused image onto an undulating surface. A layered mixture of three different materials has been developed and is made as required. It is an ultrathin, flexible, slightly elastic material suitable for inkjet printing with pigmented ink. It is made of two thin layers of ink-jet ground backed with an acrylic gesso and then an elastic, acrylic support. It is built in seven layers rolled onto a slightly textured silicon mould. The skins have a short working life and need to be made freshly to ensure that they stretch and fit the surface in the correct way. 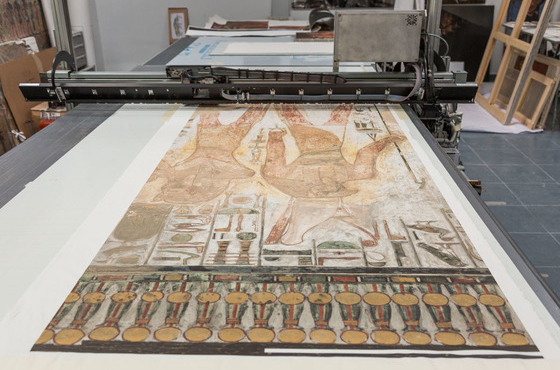 The skins can be printed in sheets that are one and a half metres wide and up to three meters long, minimising the number of joints in the final facsimile. When everything has come together the culmination is an incredibly impressive exhibition. In the case of Seti I, this exhibition took place in the Antikenmuseum in Basel, Switzerland. 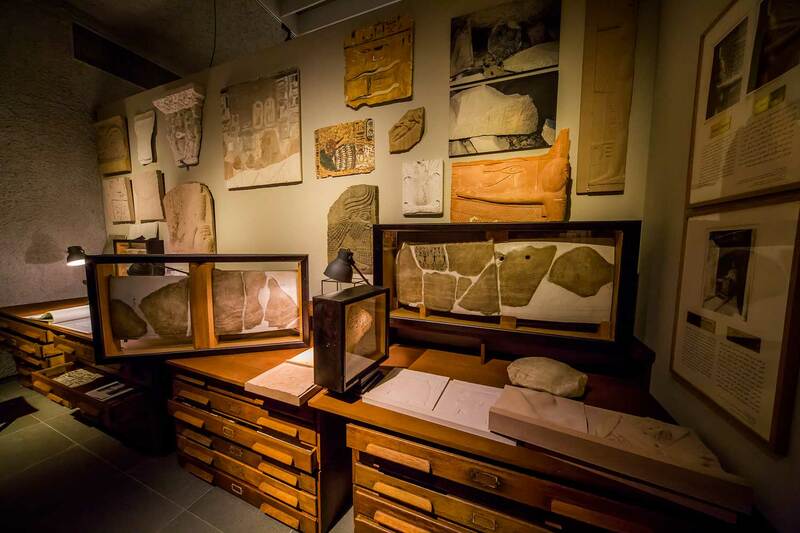 A full catalog of artifacts, tomb facsimile, educational content, and interactive areas have come together to educate museum goers not only on the tomb but the rediscovery and fabrication. 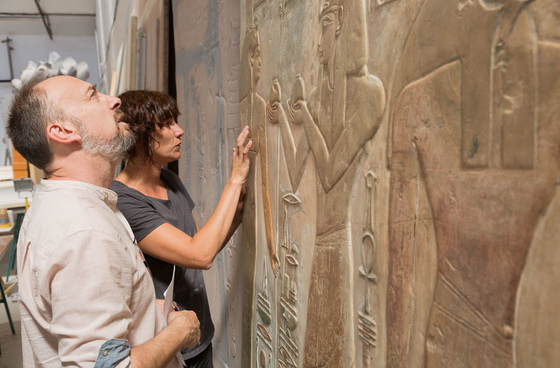 Additional details, including panels and artifacts now being held in museums throughout the world, were all painstakingly scanned and brought together with the tomb. 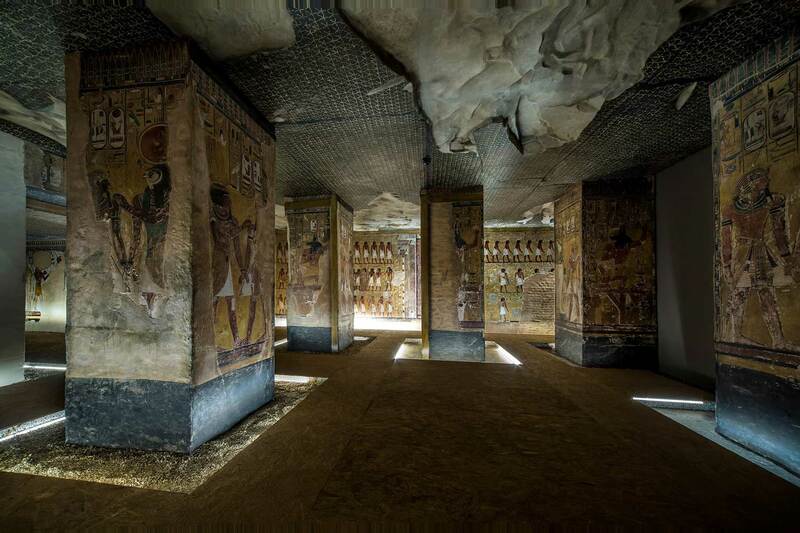 This is the first time since its rediscovery that the tomb can be seen as a complete exhibition. 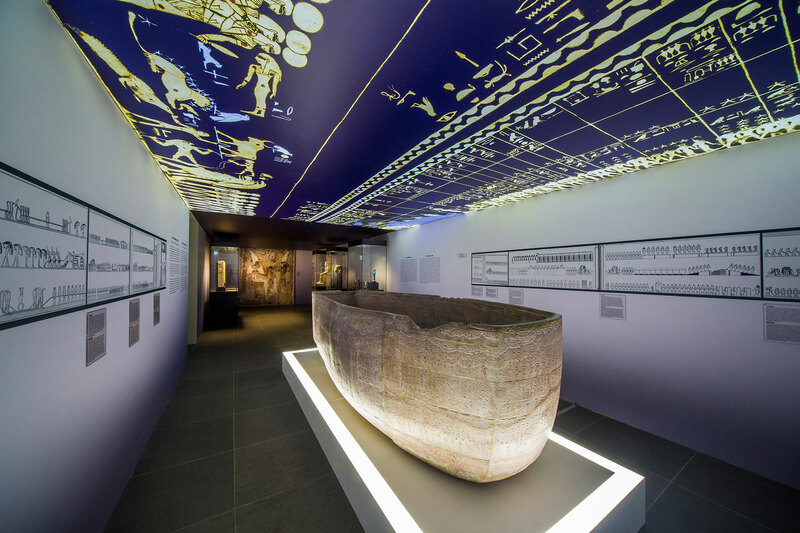 Lastly, the tomb illustrates the meanings behind the hieroglyphics and ritual artifacts found throughout the exhibition. Imagine getting to learn about the ancient Egyptians in a setting like this. Artifacts you can touch, information on the purpose of each item, background on the discovery and extraction by Belzoni, and all over 3000km away from their current resting place in Egypt. Exhibitions such as these showcase what is possible if you have the inspiration, technical knowledge, and equipment at your disposal. The Factum Foundation for Digital Technology in Conservation is a not-for-profit organisation, founded in 2009 in Madrid. It works alongside its sister company, Factum Arte: a multi-disciplinary workshop in Madrid dedicated to digital mediation in contemporary art and the production of facsimiles. The Foundation was established to demonstrate the importance of documenting, monitoring, studying, recreating and disseminating the world’s cultural heritage through the rigorous development of highresolution recording and re-materialization techniques. Article has been provided by Factum Foundation.